Carpal tunnel syndrome (CTS) is an injury caused by a pinched nerve in the wrist. The injury causes pain and numbness in the index and middle fingers and weakness of the thumb. 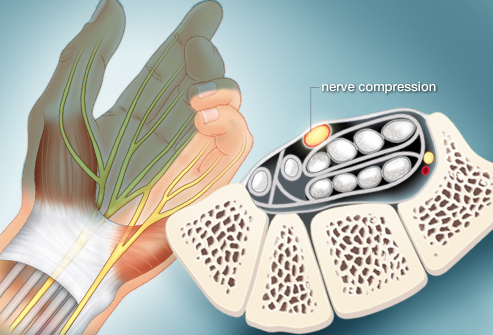 The carpal tunnel receives its name from the eight bones in the wrist, called carpals, which form a "tunnel" through which the nerve leading to the hand extends. People working with small hand tools in manufacturing and those using a computer keyboard on a regular basis are especially at risk. Women are more likely than men to develop CTS. It most commonly occurs in people ages 40 -60. CTS is associated with health conditions, such as Lyme disease, rubella, pregnancy, and menopause. High caffeine, tobacco, or alcohol intake are contributing risk factors. CTS is commonly treated by chiropractors. The methods most chiropractors use to treat CTS include manipulation of the wrist, elbow, and upper spine, ultrasound therapy, electrical stimulation and wrist supports. We now are using Laser Therapy with great success. Two studies support the use of chiropractic treatment for CTS.